A ‘catch-all’ email account collects all messages addressed to non-specified usernames at the domain. Your domain is www.example.com and you set up a catch-all email as info@example.com. You have two email accounts set up for this domain, such as info@example.com and sales@example.com. 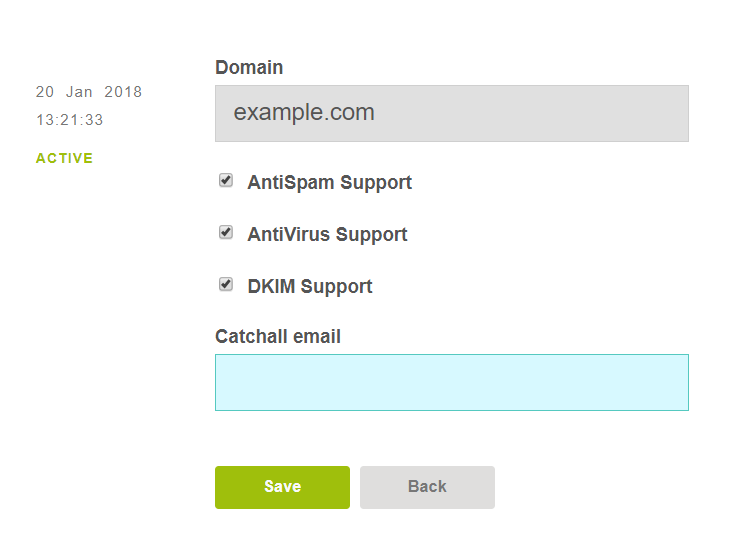 All emails addressed to this domain (anything@example.com), except info@example.com and sales@example.com will be routed to the catch-all mailbox. You can use set up a catch-all email at your domain through your control panel. Navigate to Mail section. Then select the domain you want to create the catch-all email for and click on the ‘Edit’ button. Input your catch-all email address in the catch-all field and click Save. To actually be able to check your email received through the catch-all email, the mailbox must be a valid account.You might want to create a catch-all email box or use an already existing email account.